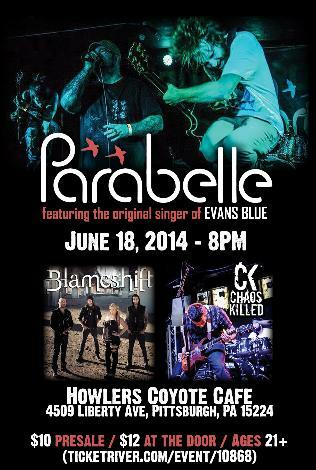 Parabelle w/ Blameshift, Chaos Killed, For What It's Worth - Wednesday, June 18th, 2014, 8:00PM @ Howlers Coyote Cafe, Pittsburgh PA. $10 presale / $12 at the door. Ages 21+. If you have questions about this event, contact Mike at (724) 822-5521 or mikehough@live.com.